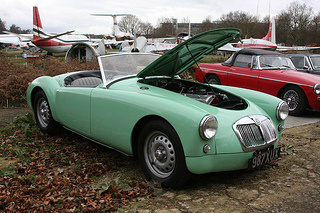 The MGA Twin Cam sports car was introduced in 1958. Originally, the engine to be used was an overhead cam version of the B-Series unit, and one that had never been used on any other car. In fact, the last roadster to use a twin cam engine was the MG PB, back in 1936. Because push rod engines were easier to manufacture, were less expensive, and more reliable than the twin cam version, it was these that were used post 1936. However, since it was becoming increasingly difficult to generate more than 60-70 bhp from the B-Series engine used in the MGA 1500 and MG Magnette saloon car, it was decided to revisit the twin cam option. Also, the company wanted MG to return to the race track from which it had been absent for a number of years. 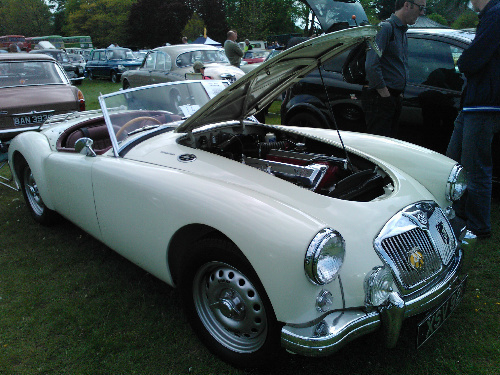 In fact, as far back as 1955, an MGA was fitted with a prototype twin cam engine, and was raced in the Dundrod Tourist Trophy Race. Consequently, the existing B-Series engine was bored out to increase capacity from 1498 to 1588 cc. The crankshaft used only three narrow main bearings, and the con rods were greatly strengthened. The twin overhead camshafts were positioned within a light alloy cross flow cylinder head, and the hemispherical combustion chambers used two valves per cylinder, and were employed to create the very high compression ratio of 9.9:1. It used two 1.75 inch SU carburettors on the LHS of the engine, and there was a new manifold with separate down pipes for each cylinder. The result was impressive, with the engine producing 108 bhp at 6700 rpm, and a torque of 104 lb-ft at 4500 rpm. However, reliability problems with the engine dogged the car from the beginning. This was due to the fact that the very high compression required perfect ignition timing coupled with the use of the highest octane fuel. Without these ideals, holes could be burned in the pistons. Furthermore, since the twin cam engine used rings and bores that were chromed, this caused it to use large quantities of oil. Sadly, all these problems were addressed just before production, which was now down to a trickle, was halted in 1959, by which time the damage to the cars' reputation had gone too far. One solution that was employed was to reduce the compression ratio from 9.9 to 8.3:1, which reduced power to 100 bhp in this low compression variant which was introduced later on. However, coupled with these problems, was the stiff competition that it received from the likes of the Triumph TR3A and the Austin Healey 100-6, both of which offered better performance. 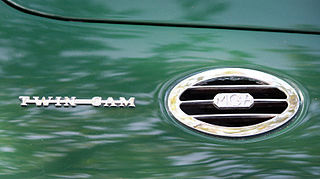 Externally, it differed very little from the MGA 1500 sports car, except for the Twin Cam badges on the top of the bonnet near the air intake grille, and on the boot lid below the MG badge. Wire wheels were not offered as an optional extra. Of the 2,111 MGA Twin Cam sports cars built, 1,801 were convertibles and only 310 were the fixed head versions. A 1958-60 MGA Twin Cam in superb condition would command anything up to £53,000/$85,000.